If you weren't already aware, Escentual.com are offering up to 1/3 off nine different French pharmacy brands, including Vichy, La Roche-Posay, Avene, Caudalie and Nuxe, for the whole of March. In case you're thinking of placing an order I thought I'd show you my recommendations for products that I think are worth investing in and do a little wish list for products I'd love to try. I haven't tried that many French pharmacy products, and some of the one's I've tried and would recommend are not included in the offer, but the majority of the products I have tried I've loved. Last year I took part in Escentual's micellar blind trial, which involved 100 people testing out 7 mystery micellar water samples. 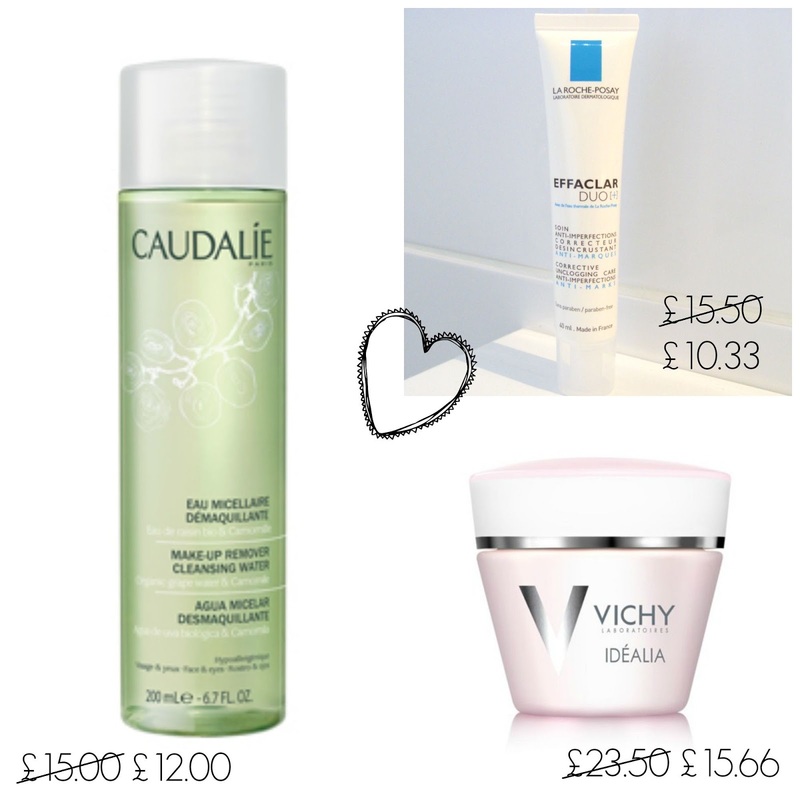 Although the overall winner was (probably unsurprisingly) Bioderma, my favourite was actually Caudalie's Make-up Remover Cleansing Water, although it was very close between this and Bioderma for me. The only reason I don't currently use this is because it's quite a bit more expensive than Bioderma and also I have a litre of Bioderma to get through. My last post sang the praises of La Roche-Posay's Effaclar Duo [+] so I don't think there's much more to say about this here other than you need to try this if you have acne-prone skin and acne scaring and this is an offer too good to miss at a third off. Ok so I have to admit that I haven't actually tried Vichy's Idealia Smoothing and Illuminating cream just yet, but I did receive a sample in a Glossybox a while back and after coming across the sample in my draw this week and having a quick swatch on my hand, I can't wait to give it a try. This left a beautiful glow on my hand, absorbed quickly and left my skin feeling lovely and soft. With a third off, making this just £15.66, I would definitely recommend giving this a try just based on that swatch. I haven't tried Vichy's Idealia Life Serum (I probably should as I have several samples lying around) but I've heard nothing but good things about this in other bloggers posts. This is quite an expensive product at £29.95 a bottle, so a third off making this just £19.96 is a bit of a bargain. My skin is pretty clear at the moment (Effaclar Duo [+] has a lot to do with this!) and the redness I suffer with across my cheeks is also pretty good so I don't currently need a high level of coverage from my makeup. But when I am suffering from a bad breakout or when my redness flares up I want something with a very good level of coverage to hide it all away. I've never actually tried a very high/full coverage foundation, but if I was going to give one a try Vichy's Dermablend Fluid Corrective foundation would be one I would definitely consider. I've never been a fan of BB creams at all as they just don't provide enough coverage for me. However I would like to give a CC cream a go and La Roche-Posay's Rosaliac CC Daily Unifying Complete Correction Cream (just a slight mouthful!) really appeals to me. This is designed for sensitive skin that is prone to all types of redness and provides immediate coverage with long-term correction. This can be used in place of both moisturiser and foundation and contains SPF 30, which would make it great for the summer when you want to wear something lighter but still need some coverage. Sounds like a winner all round to me and with a third off it's just £13.00. At the end of February I noticed that I had a couple of eczema patches that had come up on my chest. I do tend to suffer with these where my bra straps rub on the skin where my arms meet my chest and I try to keep these areas moisturised to try and stop it happening. However last weekend I discovered that one patch had started to spread up over my shoulder and down my back and I started to get quite distressed by it. I used to have a prescription steroid treatment that I have just thrown away as it was out of date anyway, but I hate using it and want something more natural and less damaging. I hunted through some mini Bioderma samples that Escentual's kindly included when they sent me a product to try out and have currently been using Atoderm PP Baume. 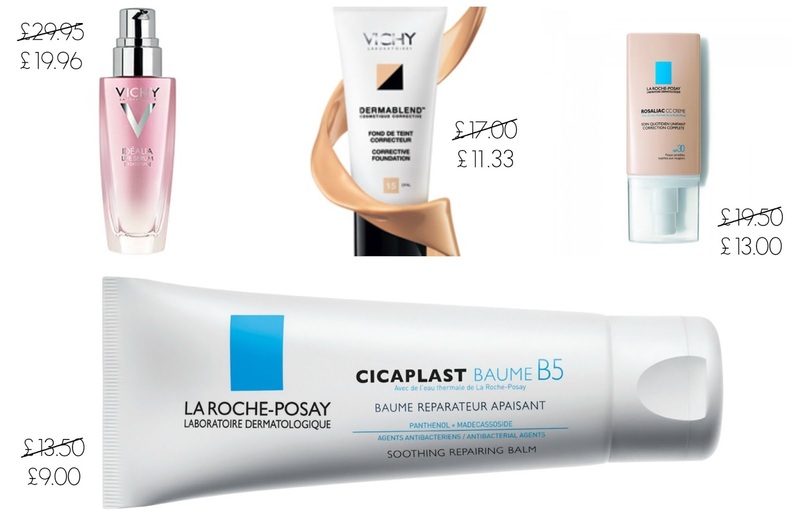 Another product that has been recommended to me is La Roche-Posay's Cicaplast Baume B5, which is currently available with a third off at just £9. I haven't included this on my collage but I'd also love to try Nuxe's Reve de Miel honey lip balm as I've heard great things about this. I like to use a thick lip balm at night, especially in the winter, and am currently using Philosophy's Kiss me tonight intense lip therapy. But at £16 a time (for a lip balm!) and after deciding not to buy any more Philosophy products after a bad reaction, I won't be purchasing this again. At £9.50, but currently with a third off making it just £6.33, this is a much cheaper alternative. Will you be treating yourself to any French pharmacy goodies?